If ever there was a song that sounded like something created to confirm old people’s preconceptions and prejudices about music created post-Beatles, it’s almost undoubtedly “Inch,” by Inch (with vocals by Mark E. Smith of the Fall). With a brutal, looped at such a point that it sounds too short (and unfinished as a result), riff and sampled drums that are similarly off-kilter and seem to be fighting with everything else in the track, this is a mess way before the theramin (or keyboards that sound theramin-esque? I’m not sure) comes in for full overload. But nonetheless, it’s great, from the hilariously deconstructive opening (which, really, makes Mark E. Smith sound like a crazy old man) to the overkill of the static/feedback at 2:55; there’s something winningly chaotic and scattered and… well, catchy, about this song, to me. Especially when MES ends up doing his weird sing-along thing right at the end. “Inch,” then: A mess, but the very best kind of mess imaginable. It’s possible that, if someone said to you, “what do you get when you put Rod Stewart and Paul McCartney’s post-Beatles output together,” your answer would be “an unlistenable, sentimental mess,” and – let’s face it, in most cases, you’d be entirely correct. But then you get this, as the exception that proves the rule. I’ve always loved “Maybe I’m Amazed,” which I’m pretty sure I first heard as a Carleen Anderson cover (produced by Paul Weller) at some point during the mid-90s. There’s definitely the McCartney sentiment at play, but it’s phrased in such a way – and couched in such wonderful music – that it doesn’t feel treacly or overly saccharine, as so much solo (and Wings-era) McCartney can; instead, it feels genuine and quite lovable. The original version is a great performance – Paul is in belter-mode (Listen to his voice at 0:47! ), and the odd arrangement has an intensity and a push there that seems at odds with the vocal at times, but adds to it, at the same time; I especially love that the song seems to finish at 3:01, and then comes back for an instrumental coda that ends with a stompy, jammy mess. There’s a messiness there that really appeals to me, and makes it just ugly enough to feel like something more than a pretty love song. Recent cover versions have lost this; you hear Jem covering it, and it’s… pretty, but that’s it (Pretty vacant, says John Lydon from thirty years ago, and he’s right). At its best – the McCartney version or the Faces version I started with – this is a weirdly masculine song because of the awkward interplay between the lyrics, the vocal performance and the guitar rock structure that goes off into riff-city when it gets too embarrassed by the honesty of what the words are trying to reveal. Yes, the basic melody means that it can be a pretty song, but I always think that it’s not meant to be; it’s supposed to be something more complex and confused. I found out, earlier this week, that the remaining members of the Beatles had threatened the Chemical Brothers with legal action over “Setting Sun”‘ s similarity to “Tomorrow Never Knows” from Revolver, only for Sony to hire various musical experts to “prove” that the two songs were different enough so as not to be legally actionable. There’s something amusing about that, in no small part because “Setting Sun” pretty much is “Tomorrow Never Knows,” or at least the younger, angrier brother of that song; I remember when the song was new, and DJs would mix the two together, and all of us Britpop fans would nod our heads and go “yes, the Beatles really did invent everything” as if that was somehow gospel fact as opposed to Brit-centric nonsense. “Setting Sun,” though, felt like a breakthrough for the Chemical Brothers at the time, at least for me. It wasn’t their first track with a vocalist – Tim Burgess and the wonderful Beth Orton had been on the first album, Exit Planet Dust – but it was their first track that felt as if it was “a song,” with a beginning, middle and end, and enough give and take within it to work as a club track, too. There’s an organicness to “Setting Sun,” the structure of it if not the way it sounds, electronically screaming at you, that wasn’t present in their earlier work, and a playfulness, too; it’s something that works in more locations than just the dancefloor, and a sign of where they’d go on Dig Your Own Hole, the album that followed (and ended up becoming a home to this track). But back to the Beatles; it’s not just any similarity to “Tomorrow Never Knows” and Noel Gallagher’s vocals that remind the listener of the Fab Four; the drums, if you listen to them as a loop and then separate that loop in your head to the singular beat that is looped, sounds like something Ringo would play (It actually really reminds me of his infamous “Strawberry Fields Forever” drum riff), and the… more choral vocals… (which isn’t the right way to put it, but the vocals that are sampled and used as music as opposed to Gallagher’s lead vocal) are reminiscent of the mythical “Tomorrow Never Knows” that was never made but John Lennon had imagined, with the monk chanting on the top of a hill providing the main musical accompaniment. It’s odd to hear Noel Gallagher perform this song on his own, and give it – well, a melody, which the original purposefully doesn’t have; it becomes a gentler song, something more melancholy, which is odd to imagine. The “Setting Sun” on Dig Your Own Hole is a battle song, a call to arms for a culture war as much as “Tomorrow Never Knows” was, way back when. I love this song, as much for what it implies and brings to memory as much as what it actually is, but those two things feel very linked: It’s about being young and out of control and now, more than a decade later, it’s become that song for me in an entirely different direction. Someone – I can’t remember who, but I suspect it may have been the girlfriend I had when Ben Folds Five, the debut album, came out – once called “Underground” a song that sounded like it should’ve been done by the Muppets, and I completely understand where they’re coming from; there’s a… jauntiness, might be a good way of putting it, or a particular perkiness to the song that feels like it should be coming from a bunch of felt-covered creatures who can open their mouths to 90 degree angles. To be honest, that’s one of the selling points of the song for me, this unstoppable enthusiasm and energy that just bowls you over and dares you not to want to sing along, even before you’ve realized that the lyrics are making fun of what, even in the late ’90s when this song came out, was called “alternative culture” (My favorite lyric may be the “It’s industrial!/So work it underground” couplet, which is punctuated by one weak metal clink and sung in high harmonies, so amazingly non-industrial and at odds with the idea of what that music wanted to be). Considering BF5 was always dominated by the eponymous Mr. Folds – and somewhat understandably; his name was in the band’s (joke) name, and he wrote or co-wrote almost all of their material, as well as being lead singer and having his piano right up there in the mix at all times – it’s worth singing the praises of Robert Sledge and Darren Jesse, the other members of the band. They’re the ones who make “Underground” work, in a weird way; not just in their harmony/backing vocals, but with the bass and drums, grounding the song and giving the piano some weight as well as something to play off’ve. There are live versions from Ben Folds’ solo career of this song, and it’s not just that something’s missing, it’s that everything feels missing; for all the dazzle of Folds’ performance – and it is, genuinely dazzling; this was the band’s first single, and it sounded so fresh and different on the radio because it was the mid-90s! Who sounded like that then? – the song belongs to Sledge and Jesse; they may not have provided all of the Muppet-iness to the final product, but they came up with enough power to take the song beyond a one-hit-wonder thing that you smile at and never need to hear ever again. 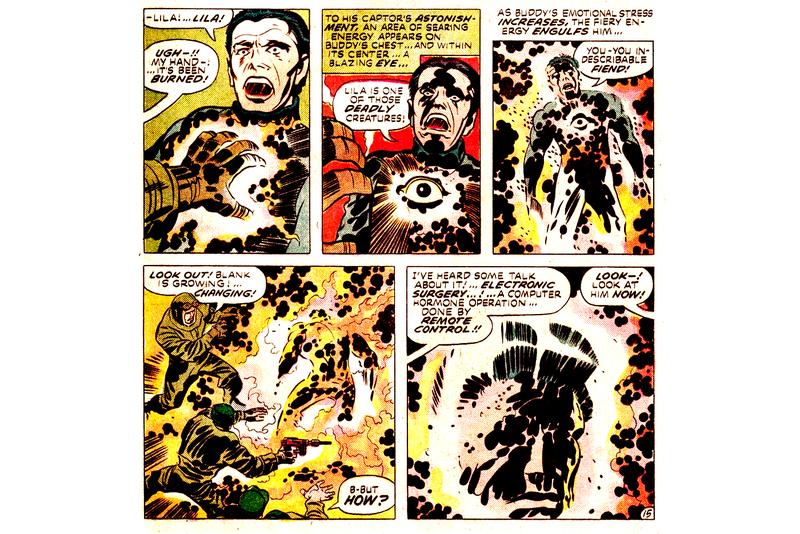 Kirby does synaesthesia, from Forever People #2. There’s something wonderfully compelling about an old square’s idea of being “turned on” to the flower people, especially when he’s doing it years after the peak of the flower children movement. I’m not being sarcastic, I should add; I think I like Kirby’s take on psychedelia more than I like the “real thing” in many ways – there’s a purity of intent to it that was very quickly vanquished from the genuine article. Kirby’s Forever People must have seemed out of touch when it appeared in 1971, as opposed to the more charming “out of time” quality that it has now, because it was too close to what it was writing about, but not close enough to be concurrent with the movement… But, looking back now, all I can really think is that I wish that Kirby’s version of the Age of Aquarius had come to pass, somehow. What’s particularly frustrating about this is that I’d never realized it before; I’d noticed that some of the “original” tracks from Holmes’ Out of Sight soundtrack are essentially versions of Isley Brothers songs that also appear on the soundtrack but never that a song from my favorite Beatles album so prominently “influenced” one of my favorite tracks from the Twelve soundtrack. Of course, now that I’ve been told, it’s all I can hear. Soon, the two will be joined in my head, and hearing one will immediately bring to mind the other, no matter what the circumstances. Such are the connections my brain makes, and never lets go of. Is it possible to take a mental health day from a blogging deadline that you’ve set for yourself? Probably not, but that’s what I’m doing today, and instead leaving you with this example of a Four Tet remix significantly improving a song, as referenced yesterday: Beth Orton’s Daybreaker, which goes from a weird song with a strange arrangement that sounds entirely out of place with the vocal, and weirdly influenced by bad acid house music of the 1980s, to something that sounds much more enjoyable and organic to my ears. It might be something as basic as the added echo and acoustic guitar that ground the Four Tet version for me, but, yeah… the second version is almost unimaginably better, if you ask me. The delicatessen had three or four tables at which people could sit, purchase a cup of coffee, and read out-of-date Continental newspapers. There was always a copy of Le Monde and Corriere della Sera, and sometimes Spiegel, which Isabel found interesting because of its habit of publishing articles about the Second World War and German guilt. It was important to remember, and perhaps some Germans felt that they could never forget, but would there be a point at which those awful images of the past could be put away? Not if we want to avoid a repetition, said some, and the Germans took this very seriously, while others perhaps preferred to forget. The Germans deserved great credit for their moral seriousness, which is why Isabel liked them so much. Anyone – any people – was capable of doing what they did in their historical moment of madness – and their goodness lay in the fact that they later faced up to what they had done. Did the Turks go over their history with a moral fine-tooth comb? She was not aware of it, if they did, and nobody seems to mention the genocide of the Armenians – an atrocity which was virtually within living memory – except the Armenians, of course. And the Belgians, she suddenly remembered, who had passed a resolution in their Senate only a few years previously noting what had happened in Armenia. Some had said that was all very well, but then what about what Leopold did in the Congo? And were there not islanders, somewhere in the Pacific, whose ancestors stood accused of eating – yes, eating the original inhabitants of the lands they occupied? Most unfortunate. And then there were the British who behaved extremely badly in so many parts of the world. There was the woeful story of the extinction of the Tasmanian aboriginals and so many instances of cruelty and theft under the bright protection of the Union Jack. When would British history books face up to the appalling British contribution to slavery, which involved the Arabs, too, and numerous Africans (who were not just on the receiving end)? We were all as bad as one another, but at some point we had to overlook that fact, or at least not make too much of it. History, it seemed, could so quickly become a matter of mutual accusation and recrimination, an infinite regress of cruelty and oppression, unless forgetfulness or forgiveness intervened. – Alexander McCall Smith, Friends, Lovers, Chocolate. It’s another odd week; it feels as if January has just been odd weeks, each one with its own flavor of weirdness, either bemusing, confusing or patently overwhelming, so why should this one be any different, right? This particular week, so far, has been stuttering, stopping and starting in terms of energy and productivity, so it’s no surprise that I’ve had this song in my head for the last couple of days. Well… “song” feels like the wrong thing to write, in a way, because “song” for me feels as if it should have lyrics and singing, so… this is a tune, I guess? It’s the first Four Tet track proper that I listened to after countless times hearing a Four Tet remix of someone else’s music and thinking to myself, this is great, I should try and trac down more of this and utterly failing in my own plan. And, as an introduction to everything I like about Four Tet, it’s pretty much perfect; the mix of the organic and the digital sounds, the feel of an updated jazz sound – the simplicity of that guitar riff – that also somehow feels like some kind of comedown track you’d hear at the end of a Chemical Brothers album or something similar (especially at 1:27 in this video, where the bass and drums are suddenly looped much tighter, and become this wall of sound, or at 2:20, when the guitar appears again, reversed). But it also has the emptiness that makes me wish that Four Tet tracks had more of the emotionality and character of the tracks he’s remixed for other people; by the end of the track, you’re ready for it to be done, if that makes sense – The cleverness and playfulness has ceased to be a novelty, and you’re left wanting it to make one more evolution and turn into something that’s ultimately more interesting.